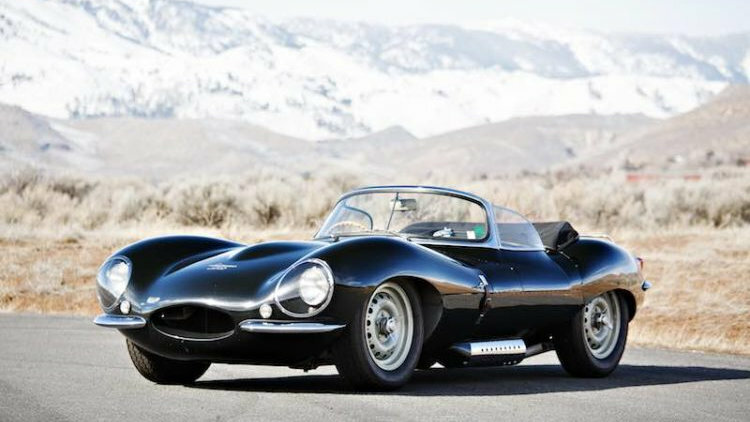 A rare 1957 Jaguar XKSS (estimate $16-18 million) will be the lead car at the Gooding Amelia Island 2017 classic car auction in Florida. Gooding & Company announced a 1957 Jaguar XKSS, estimate: $16,000,000-$18,000,000, as its lead car for the Amelia Island classic car auction on March 10, 2017 in Florida, USA. The XKSS is considered by many to be the ultimate road-going Jaguar. It is based on the Le Mans-winning D-Type and only 16 were ever produced. 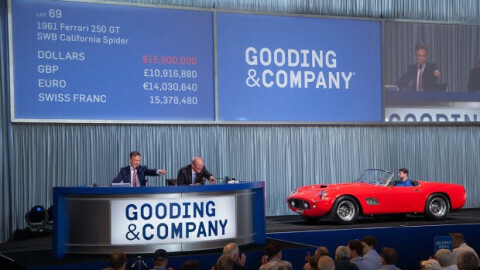 If the Jaguar sell at estimate, it may challenge the 1961 Ferrari 250 GT SWB California Spider that Gooding sold in 2016 for $17,160,000 for the Amelia Island auction week record. Jaguar had tremendous racing success with the company’s D-Type, most notably three overall wins at the 24 Hours of Le Mans (1955, 1956, and 1957), two wins at the 12 Hours of Reims (1954 and 1956), and outright victories at the 1955 12 Hours of Sebring and the 1956 Grand Prix of Spa. In October 1956, at the height of the D-Type’s career, Jaguar announced that it was temporarily retiring from motor racing to focus on production cars. The 1956 Le Mans-winning 1955 Jaguar D-Type sold for $21,780,000 at RM Sotheby’s Monterey 2016 as the most-expensive British car ever sold at public auction. On January 21, 1957, the company publicized plans to build and sell an exclusive run of 25 road-going sports cars based on its Le Mans-winning D-type, to be known as the XKSS. Jaguar had constructed only 16 examples of the XKSS when, on the evening of February 12, 1957, a fire engulfed the Browns Lane plant, destroying the nine unfinished chassis. The illustrious model has always been highly sought after; famed actor and racer Steve McQueen had to have one and was often seen racing around in his beloved XKSS. One of the ultimate road and racing cars from the 1950s, this beautifully presented Jaguar is sure to excite every enthusiast and collector next month. The car presented here, chassis XKSS 716, (estimate: $16,000,000-$18,000,000), is one of those 16 original examples of the famed roadster. The Jaguar was delivered new to Montreal, Canada, where it was raced to many first-place finishes in Canadian sports car events from 1957 to 1961. The XKSS was sold amongst prominent Jaguar enthusiasts, where it continued to race in various events and enjoyed at numerous vintage rallies, until the current owner acquired the car nearly two decades ago. About ten years ago, XKSS 716 received a complete, show-quality restoration by UK-based marque specialist Pearsons Engineering. Beautifully restored and refinished in an attractive deep, dark green, XKSS 716 made its concours debut at the Pebble Beach Concours d’Elegance® in August 2010, where Jaguar was featured in recognition of its 75th anniversary. To honor the company’s most famous and beloved car, the show’s organizers arranged a special XKSS class, reuniting 12 of the 16 original cars. Since this outing, the XKSS has been shown at the prestigious Concorso d’Eleganza Villa d’Este and driven on exclusive tours in Europe and North America. A decade has passed since the last XKSS was offered for sale at public auction, with most examples now guarded in private collections. When the next example might become available is anyone’s guess, but it will almost certainly pale in comparison to XKSS 716. The 1957 Jaguar XKSS is likely to become the second most-expensive Jaguar ever and only the third to sell for over $10 million. The marque record was set at RM Sotheby’s Monterey 2016 sale when the 1955 Jaguar D-Type sold for $21,780,000 – this car won Le Mans in 1956 as an Ecurie Ecosse entry and set the record for the most-expensive British car ever and the most-expensive Le Mans winning car ever sold at public auction. At Monterey 2015, RM Sotheby’s sold the first Jaguar ever for more than $10 million when a 1953 Jaguar C-Type Works Lightweight that finished fourth overall at Le Mans in 1953 achieved $13,200,000.